The Sagittarius New Moon occurs on Saturday, November 22nd at 5:32 am MST at 0 degrees Sagittarius 7 minutes. Here’s the chart: SagittariusNewMoon2014. 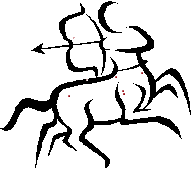 Sagittarius’ glyph is the centaur which symbolizes the fusion of man with nature. Sagittarius is the truth seeker who travels far and wide continuously expanding his understanding of the Universe and his place within it. His arrows are aimed at the heavens where he knows truth resides. The principle of expansion is governed by this restless adventurous sign and its ruling planet Jupiter. Sagittarius natives naturally pursue higher studies and distant lands and people. Although Sag is naturally drawn to foreign countries and cultures, its most important journeys lead it inward to the core of its very own Soul. Sag is also associated with natural laws and natural spiritual principles that underpin all of manifest creation. The truth its looking for is ever present in the natural world or nature. This is why so many Sagittarian natives prefer life in the country rather than urban settings. They feel most at home in nature and nearly always have a greater affinity for plants and animals than others. In fact, many a Sag has chosen a career that involves work outdoors in support of wilderness or ecological preservation, conservation or restoration. Sagittarius is associated with the right brain which is the source of intuitive thoughts. Indeed the primary evolutionary purpose of individual intuition is to lead us to our own personal understanding of truth. Sagittarius is conceptual and abstract. This enables it to see the whole picture not just the parts. Perhaps intuition is best described as simply knowing what we know without knowing how we know it! Those with a strong Jupiter in their charts or great emphasis in the sign of Sagittarius are centered in their right brain. In a culture such as ours which is so biased towards left brain logical, linear, deductive thought processes, right brain people often feel like they just don’t fit in. Centered in their right brains, these folks just see the world differently – holistically – not logically. Again, the result is that Sag typically feels alienated from mainstream society and consensus reality. Jupiter rules this Sagittarius New Moon and is currently slowing down to a standstill before it stations retrograde in Leo for four months beginning December 8th. Stationary planets are powerful. Intuitive faculties will increase in strength over the coming weeks so listen, Listen, LISTEN to your intuition for clues about what’s next for you on your own personal evolutionary journey. Take time to be quiet, go inside, and receive guidance about what’s coming, what’s next and what’s important for you to know or do or focus upon in order to move forward in alignment with your Soul’s deepest desires. The left brain and its logical thought processes are ruled by Mercury. Mercury and Jupiter are square one another now leading us to question everything and doubt our intuitive insights! What’s true? What’s not? You may wonder if certain thoughts are your intuition or your imagination. The way to recognize the difference between the two comes from knowing that intuitive thoughts always occur INSTANTANEOUSLY in any given situation. Rational, logical, deductive thought processes always follow intuitive thoughts. So pay attention to your very first ‘hit’ when something occurs to recognize intuitive guidance. Old thoughts, ideas, perspectives, opinions and beliefs may be dissolving creating mental crises. It may feel like a struggle to discern truth from lies, fact from fiction, and fantasy from reality. Again, trust your intuition to help you navigate all the confusing, contradictory and competing information that will no doubt come your way this month. Trusting, honoring, respecting and acting upon intuitive thoughts EXPAND intuition. That would be a very good use of this month’s Sag energy! The Sun in Sagittarius will square Neptune in Pisces on the 26th adding to the potential for confusion. Old realities are dissolving now and new understandings may not yet be completely clear. While the Sun and Neptune can inspire us to reach for higher altruistic goals, humanitarian efforts and spiritual pursuits, it can also utterly disappoint or delude us if we avoid or deny reality. See people and circumstances realistically, not as you wish them to be. And be very mindful of the temptation to hold onto an identity or consciousness of victimization which frankly has become the norm in our culture. That quality of consciousness will only serve to maintain delusions and distortions of the truth, undermining spiritual growth and maturity. Saturn is finishing up its transit of Scorpio (October 5, 2012 to September 17, 2015) and is coming into a culminating aspect with Pluto in Capricorn. Together, these two planets are helping us to throw off old realities that no longer work. Saturn and Pluto require greater self-responsibility and personal accountability from all of us. They also demand that we learn to use our power appropriately. Misuses of power and authority are being increasingly exposed now. Even so, many in power continue to hold onto old conventional social/political structures (such as governments) digging in with all their might to maintain the status quo, a game they’ve been ‘winning’ for a very long time. Are you taking greater responsibility for the reality you’re co-creating both individually and as a member of the human collective? Are you owning your personal power or do you feel powerless? Remember the ultimate human power is the power of free will choice. Free will choices are the driver of the evolutionary process itself. How are you using your personal power? What choices are you making? Our collective evolution now requires that we throw off these old patriarchal realities of hierarchy, dominance, fear, exclusion, self-interest and a belief in scarcity of resources. To evolve, we must return to a matriarchal way of life. Matriarchy is a collective consciousness reality paradigm rooted in natural laws and principles. Its a way of living in harmony with nature that’s based upon giving, sharing, love and inclusion that considers the needs of everyone, from a point of view of abundance, interconnectedness and the belief in the sacredness of all forms of life. Mars in Capricorn is also in a culminating aspect with Neptune in Pisces. This planetary combination restates the need to reach higher, envisioning and co-creating that which will benefit everyone. Those operating solely out of self-interest will find themselves increasingly alienated and socially isolated in the coming months and years. Perhaps the most important planetary event in the coming month will be the sixth of seven total square aspects between Uranus in Aries and Pluto in Capricorn on December 14th. These two planets have been within orb of a square aspect (90 degree angle) for nearly five years now. And while the planets do not make things happen, they do indeed reflect reality here on planet Earth. Together, Uranus and Pluto have reflected the enormous changes that have occurred all across our planet over the past several years including the Arab Spring, the economic collapse in the United States that triggered global recessions, the Occupy Movements worldwide, revelations of widespread illegal governmental spying and scientific discoveries like the ‘God’ particle and the realization that consciousness creates reality. Lots of change has already happened AND A LOT MORE STILL NEEDS TO HAPPEN! Its crucially important to understand that evolutionary growth is a natural, spiritual imperative. As stated earlier, evolution is facilitated by free will choices. And one of the free will choices we can make is the choice to resist our evolution! But we cannot resist forever. In fact, too much resistance for too long ultimately results in the intended evolutionary change(s) occurring in cataclysmic ways in order to enforce the necessary change required. Often these cataclysmic changes are completely unexpected and sometimes traumatic. Cooperating with our evolutionary growth intentions, personally and collectively, ensures a smoother, more uniform experience of growth. Clearly, cooperation is easier than resistance. Unfortunately, when I look at our world, I see far more resistance than cooperation which leads me to believe there will likely be more shocking, unexpected and cataclysmic changes on the horizon for humanity. Its comforting however to realize that the collective is made up of individuals. Each of us can indeed contribute to the evolution of humanity as a whole as we commit to our personal evolution and make the necessary changes our Souls intend for us in our individual lives. Previously, the first five exact squares between Uranus and Pluto happened on June 24th and September 18th, 2012, May 20th and November 1st, 2013, and April 21st, 2014. The next exact square (6th of 7 total) occurs on December 14th and the final square between them will happen next Spring on March 16th, 2015. Think back to what has happened in your life over the past two and a half years especially on or around these particular dates. There you will find clues about what changes your Soul intends for you to make in your own life for your personal evolution to continue to unfold. Humanity is indeed waking up to greater truths, greater realities and to a greater awareness of our sacred responsibilities to ourselves, to each other and to this beautiful planet that is our home. We are re-awakening to the fact that we all do better when WE ALL DO BETTER – TOGETHER! We are re-learning how to meet our own needs as individuals and in our communities. As we become more personally empowered and self-reliant we’ll be able to solve more and more of the problems that undermine our personal and collective health and well-being. How are you contributing your unique skills, gifts and talents to benefit the whole? We are indeed living in extraordinary times! Each and every one of us alive on this planet today embodies a Soul that chose to be here now. Prophecies of many ancient cultures the world over have foretold these times as being associated with the potential for a quantum leap forward in the evolution of mankind. Indigenous Elders have spoken of this evolutionary leap resulting from a huge shift in human consciousness. Expansion indeed! So as 2014 comes to a close, be grateful for all you’ve experienced and learned this year. Take time to receive inner spiritual intuitive guidance. Resolve to spend more time in nature! Gather together with friends and loved ones and celebrate your accomplishments. Enjoy the holidays and get ready for an even more exciting 2015! This article is written a summary of my live hour-long audio presentation/analysis that explains the energies and influences of the New Moon chart in-depth. The audio recording is available in CD or mp3 file formats for $15. Contact me if you wish to purchase the audio recording. The Capricorn New Moon is on December 21st at 5:36 pm MST! This entry was posted in Planetary Events and tagged alienation, awakening, consciousness, cosmos, delusion, evolution, free will choices, growth, humanity, intuition, Jupiter, Neptune, Pluto, reality, retrograde, Sagittarius, Scorpio, spirituality, truth, Uranus. Bookmark the permalink.